Are you afraid of tofu? Don’t be. Yes, it’s perilously bland, bobbing around whitely in its weird aquariumish water-filled container, but as far as a high-protein, low-cost, nutrient-dense ingredient goes? It’s tough to do better. Plus, I specifically designed this recipe to combat the blandness and to make the most of tofu’s mild creaminess. Because if you bake it with a bunch of flavorful ingredients (okay, three), then they have nowhere else to go but into the tofu! Simple, inexpensive, delicious, and the oven does most of the work. If you want to cheat the “5 ingredients” rule, feel free to add other flavoring elements – ginger, sriracha, onions, garlic. Or don’t, because the tofu is savory and tangy and delicious just the way it is. Try serving it with zucchini noodles or cauliflower rice. Leftovers are great in a collard wrap or on top of a salad. Heat the oven to 400° and spray a lasagna-sized (9- by 13-inch) pan with cooking spray (or oil it well). 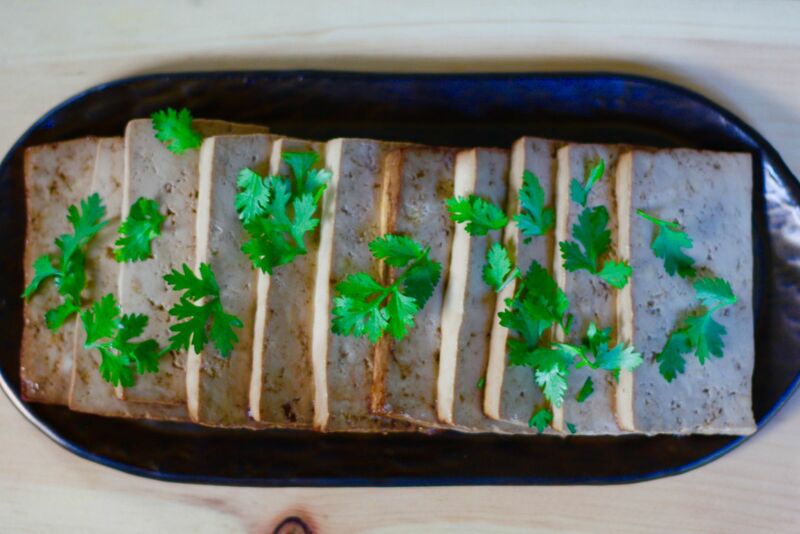 Cut tofu crosswise (the direction a loaf of bread is sliced) into 12 slices and arrange them in a single layer in the baking dish. 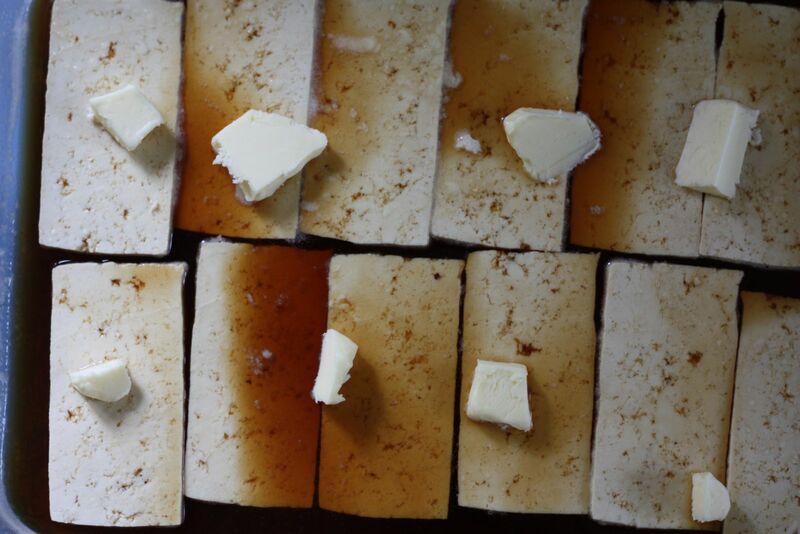 Combine the vinegar, water, and soy sauce in a measuring cup or mug and pour over the tofu. Tilt the pan around a bit so that you send a wave of marinade over the tops of the slices and all the tofu gets into active contact with it. Dot the tofu with the butter. Bake until the liquid evaporates completely and the tofu is deeply browned and sizzling in the butter, about 45 minutes. (The pan may look a bit burned around the edges – but hey, you cooked dinner, so that’s some else’s problem now, right?) Let it cool at least 15 minutes before eating so that it can firm up.